When we hear that "one person can change the world," it seems trite - but meet Hordur Torfason, a "gay rights maverick that helped topple Iceland's government." "By the time the political climate in Iceland was ripe for the Cutlery Revolution, Hörður Torfason was already well practiced at stirring things up. “'I’ve been doing this all my life,' he told IPS in an interview. "In 1975, Torfason stepped forward as the first openly gay man in Iceland, to much public discontent. After escaping an attempt on his life, Torfason moved to Copenhagen where he lived in exile for many years. However, he continued to fight for gay rights from abroad using his art to spread the message. “'The role of the artist, to me, is to defy the misuse of power in our society, and I’ve been doing that all my life,' said Torfason. "Based out of Copenhagen, he returned to Iceland every year, touring and giving concerts in support of gay rights, and he founded the Icelandic Gay Organisation Samtökin 78 in 1978. Gradually, public sentiment changed and he was able to move back to Iceland in 1991, where he has lived ever since. “'It takes years to change a society, but also it has brought forward a lot of people who are quite capable, intelligent people,' said Torfason. "Today, gay people in Iceland enjoy equal rights." "After 38 years of struggle, he thought that adoption of the equal rights bill by Iceland’s parliament in 2008 meant that his work was over. "However, the start of the country's massive financial crisis pushed Torfason back to action. On October 11, he began standing in front of the Reykjavik parliament with a microphone. Passersby were invited to talk about their dissatisfaction with the freefall of their country, to speak their minds. "Over the next five months, these sessions turned into open meetings and rallies every Saturday afternoon. Three claims predominated: resignation of the government, resignation of the board of the National Bank, and resignation of the board of monetary authorities. Torfason spoke about the variety of strategies and tactics used during the protests, from direct, yet respectful, letter-writing and meetings with politicians to what was dubbed the "kitchenware revolution": banging pots and pans in protest, known as cacerolazo in Argentina. This culminated in late January 2009 with thousands of people protesting for days on end, resulting in the collapse of the Icelandic government. As Time magazine reported "Over the past six months its currency ha(d) collapsed, its largest banks ha(d) all failed and been nationalized, and its economy ha(d) imploded." "Three major banks, 300,000 people and zero liquidity. It's not often that the wealth of an entire country is wiped out. But Iceland almost managed that when its currency, the kroner, got caught in a freefall created when investors bailed. Its billions of dollars of Euro-denominated foreign debts became unpayable. Caught in the middle: depositors in Great Britain and Germany, who were lured by rich rates being offered by Kaupthing Bank hf, Landsbanki and Glitnir Bank hf." Sound familiar? In the United States, the banksters remained untouched and the Conservatives continued to run the government behind the scenes - But in Iceland, the People moved. 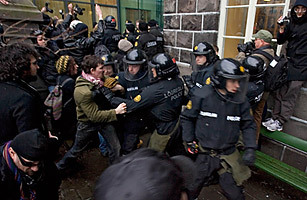 Protesters clash with police in an alley at the back of the parliament building during a demonstration over the handling of the financial crisis in Reykjavik, Iceland Wednesday Jan. 21, 2009. "The act that Torfason is most acknowledged for is perhaps leading Iceland’s Cutlery Revolution. On Oct. 11, 2008, only five days after the financial crash, Hörður Torfason planted himself outside the parliament building in Reykjavik and started putting questions to the people who passed by. Every day for a week he stood in the same spot and asked the people two questions. The first, do you know what has happened in this country? 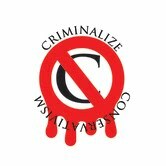 The second, do you have any ideas about what we can do about it? “Everybody was in shock. The people were not very clear on what was happening,” said Torfason. By gauging opinion on the streets, Torfason devised three demands which reflected the people’s immediate wishes: the government should resign, the board of the financial supervisorial authority should resign, and the board of the national bank should resign. “Always, I read out the three demands and I asked people, ‘Is this what you want?’ and the people said ‘Yes,’ by thousands and thousands,” said Torfason. He began to organise protests, which were held at the same time every week outside the parliament building. “I asked peopled to help me, and especially I concentrated on getting in contact with young people who are clever with the internet to spread the message, and that succeeded,” said Torfason. Just after Christmas, Torfason organised everyone to surround the parliament building on the day the MPs came back from holidays. The protest continued for five days, with the largest turnout on the last day. The day after that, the first minister resigned, and on Monday, the government resigned, taking with it the board of the financial supervisory authority. In another month, the board of the national bank would resign, meeting the third and final demand of the protestors. “To me and I think most people I talk to, if we hadn’t had the Cutlery Revolution, the far right-wing party would still be in power,” he observed. 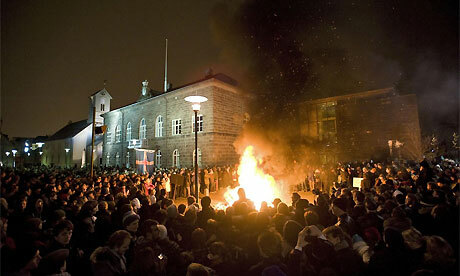 The latest development has been a constitution written by the people of Iceland themselves. Any Icelandic citizen could run to be considered for a position at the drafting table. Furthermore, everyone in the country could monitor the writing of the new constitution and submit suggestions via Facebook and Twitter. A referendum to ratify the constitution will be held Oct. 10. 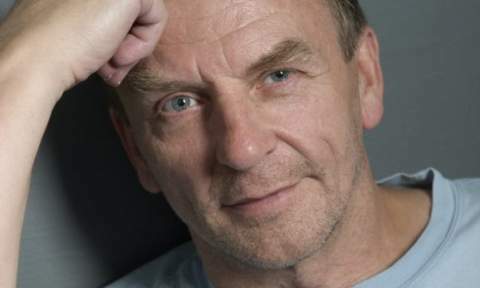 Torfason has received numerous awards for his enduring efforts as a human rights activist, including The Tupilak, from the Swedish Gay Organisation for outstanding contribution in the gay rights field in 1995 and 2009, and the Icelandic Social Democratic Party for his courage, bravery and honesty in human right struggles in 2003." Neither the judicial coup de etat here in 2000, nor the Voter Machine Theft of 2004, nor the collapse of the American economy by the banksters in 2008 caused a ripple of disatisfaction. When will the American people wake up and realize that in a democratic society that the people can jail criminals whose greed robs them, that they can take back their government and institute safeguards to make sure the greediest of the wealthy class can be controlled? Only when Conservatism is finally criminalized.